If you've read or seen any of the Harry Potter series of books or movies, you are familiar with Quidditch, a wizarding-world team sport played on magical broomsticks that allow players to fly through the air to make goals and score. 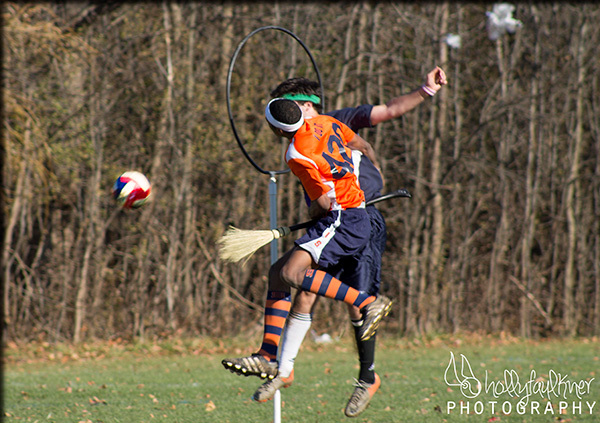 While Harry Potter plays for his house team of Gryffindor, ESF students play the international college club sport with Syracuse University (SU) students on the SU Quidditch team. How is the game played differently than in the Harry Potter series? "Obviously we don't fly," said Holly Faulkner, an ESF senior conservation biology major. However, both the real and fictional versions have the same four positions: keeper, chaser, beater and seeker. Both use a golden snitch. Nate Heath, one of the team captains for a second year and an ESF senior, and Faulkner both said the team is about 50/50 ESF and SU students, although Onondaga Community College students are accepted as well. "There's a very strong ESF presence on the team," said Heath. "We're a big family, so it really doesn't matter which school you go to." There are about 55 active players on the roster, according to Heath, and approximately 40 of those are recognized by the International Quidditch Association (IQA), a nonprofit that helps govern the sport and hosts approximately 25 events throughout the year. IQA-recognized players pay membership dues and are eligible to play in IQA-recognized tournaments. The SU team as a whole is recognized by the IQA, which provides the official rulebook on its website as well as online tests to become a referee. Heath says the team tries to go to both IQA-recognized as well as non-IQA-recognized tournaments to ensure that all the players can take part in matches. "Half of the people are there just because they like the idea of playing Quidditch. They like Harry Potter and like the idea of it. The other half are there because of the aggressiveness and competition," said Heath. He believes that combination makes his leadership position interesting. The six captains deal with the different approaches during "Sunday fundays," which reach out to new players for more relaxed scrimmages, and then two to three weekday practices for running drills and doing workouts, he said. "On Sunday, we welcome anybody that wants to play. They don't have to know any of the rules," said Faulkner. Faulkner believes those who have read the books or seen the movies will find it easier to play than others, but she emphasized the welcoming atmosphere of the team and the ease of joining at any level. Many people learn the sport as they join. The team plays throughout the school year, although usually more often in the fall, said Faulkner. There are no cuts, and the sport is open to anyone and everyone, according to Faulkner. People are free to join throughout the playing season. No one is limited to any position, and positions are determined based on each person's comfort level, said Faulkner. "We try to be as inclusive as possible," Heath said. The team advertises itself as "foster[ing] a unique social community," and Faulkner and Heath both can speak to that. "Once we leave practice, there's still a lot of connections," said Heath, pointing to team game nights and spaghetti dinners as examples. "It's hard not to make friends with everyone," said Faulkner. Faulkner said she's made many friends with SU students through the team, as well as friends on other Quidditch teams. Heath said his closest friends from SU are on the team. "After every game, it's usually a high-five or a handshake, but generally we do hugs," said Faulkner. Heath agreed, "We leave our differences on the pitch, and I think that's unique to the sport as well. Even our biggest rivals we get along with really well." The Syracuse team was one spot below qualifying at the Northeast Regionals this year; the players probably will not make it to the World Cup VII, which will take place April 5-6, 2014, in Myrtle Beach, S.C. Faulkner and Heath said that the players are now exploring other options outside of the World Cup. The team members are hopeful that they might be able to move up if another team drops out or the IQA provides an "open" tournament possibly in mid-March, Heath said. "I really like that [the sport] is very competitive, but you can't take yourself too seriously because you are running around with a broom between your legs," said Heath. "It can be very aggressive, but it's also very comical." He thinks that is what makes the sport so different and fun. Club teams are allowed to compete as "community teams," where alumni can play, said Heath, who will probably be on the team next year after he graduates, since he lives locally. "If anybody was thinking about doing it, they should definitely join," said Faulkner.